By the Sea cheez Stitched on 14ct Rustico using DMC solids & variegated and Eterna Silk and framed it. Four Square Seasons MiC On Lurex aïda 14. I changed colors and put some fruity English buttons from Debbie Cripps. * Hanging Out til the Holidays Sassy Stitched on my hand painted spring green aida using DMC threads. * I Love Firecrackers Sunnysarah Stitched on 28 ct white evenweave using recommended DMC colors, except backstitching was suppose to be black. I changed it to gold. * One Size Fits All Sassy I stitched this piece on my hand painted pumpkin pleasure aida using DMC floss. Seasons Joanne73 Stitched on natural linen with weeks dye works floss and made into a double flanged pillow. 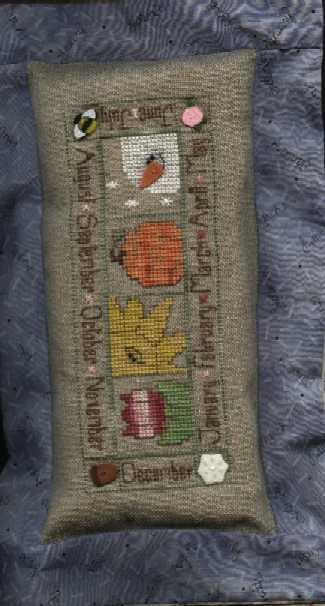 Seasons MicheleB Stitched on 28 count potato lugana and framed as a picture. Substituted the cat button. The original called for an acorn button but I didn't have one on hand.